“They removed oxidized sugar stains from my white wedding gown that were 6 years old! 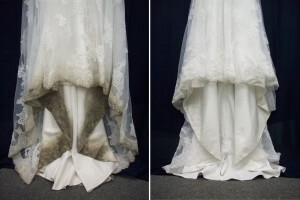 They did an unbelievable job, and I am so thankful!” | Erika M.
“I had my wedding dress ‘stored’ in a black garbage bag for nearly four years before Heider Cleaners took great care in preserving it. It’s back to its original beautiful form.” | Liz B. “…we found my mother’s wedding dress from 65 years ago in their house…I’ve researched and found Heiders was the best cleaners for restoring wedding gown. Although I was advised they could not guarantee the results due to the age, the results were amazing!” | Pam G.
“After 5 years of my wedding dress being crumpled in a closet and moved through several different states, I thought it was beyond saving. Heider Cleaners took on the tough task anyway and I am thrilled with the results!” | Claire M.